First a little history. 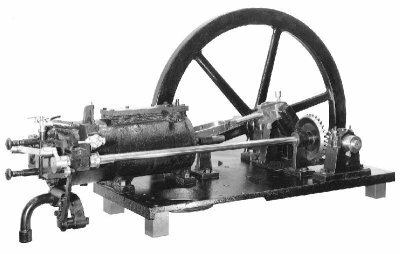 Back in the middle of the 19th Century a traveling salesman named Nicolaus Otto was reading about the new invention of the Lenoir gas powered motor. His sales area was all of western Germany and most of the traveling he did was by horse drawn coaches. Otto was a fastidious man and he was repelled by the thousands of tons of horse manure on the roads everywhere. He had a dream of developing a motor which could be fueled by liquid fuel like gasoline and small and powerful enough to propel a road vehicle. The Lenoir motor ran on town gas and was big, heavy, and stationary. Otto started working on the development of a small motor as a hobby project while he continued his trade of traveling and selling coffee, tea, and sugar. His first experiments ended with the test motor destroying itself. He pressed on and after years of work came up with a motor based loosely on the two stroke gas motor of Lenoir. He showed his work to a friend who was in the sugar factory business and from him got the funding to start a motor company. While manufacturing big stationary gas motors he continued his dream project of a small, light, and powerful gasoline motor.. The town gas motors they made were free piston atmospheric motors standing 10 feet tall and weighing over a ton. I prefer to not include a picture of the wretched thing. And they were limited to about 3 horsepower. Otto’s company hiring Gottlieb Daimler and then Daimler bringing Wilhelm Maybach aboard was the magic ingredient that made the 1876 4-stroke New Otto motor possible.. If you look close you can see the exhaust valve is operated by a roller cam..
From my research I am convinced that it was the mechanical genius of Maybach combined with the organization of Daimler both pushed by the drive and ambition of Otto which made the modern 4 stroke motor invention possible. Daimler and Maybach left Otto’s company within a few years and started their own experiments in the greenhouse on Daimler’s estate.. They were so secretive about their work that the gardener became convinced that they were counterfeiting money in their secret workshop.. The police were called and found nothing but machine tools and motor parts.. I wonder what became of the gardener? The Maybach-Daimler high speed gasoline motor became wildly successful. Most of the early development of motor vehicles was done with motors either purchased from or built under license from Daimler.. Panhard and Levassor in France and Henry Ford in the United States are a few of the users of the Maybach-Daimler motors..
Otto spent most of his time and energy fighting with the German government about his patent rights. Some say that it exhausted him to the point of causing his premature death at only 59 years old.. And old Lenoir in Paris also wound up with little to show for his efforts.. 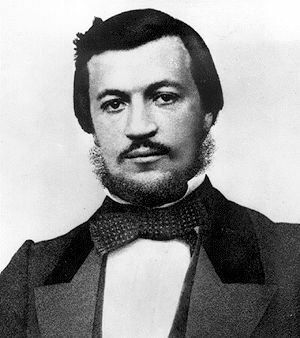 He died in poverty..
After Daimler’s death his company merged with Karl Benz’s operation and Maybach continued his fine work.. He was the one towering talent who made the Mercedes Benz possible. I am sure that without Maybach that Benz would have wound up like Otto and Lenoir..
Now for some technical talk. 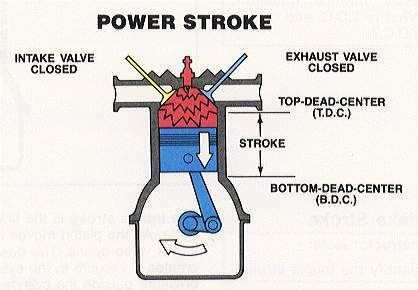 I have been going on about the history of the 4-stroke cycle gasoline motor without telling what it is.. The simple explanation found everywhere (sometimes with animations) is as follows. Each movement of the piston from the bottom of the bore to the top or from the top of the bore to the bottom is called a stroke. The intake and exhaust valves open or shut at the end of each stroke. There are four strokes in one complete cycle of the motor. 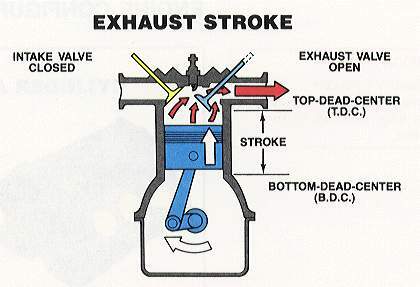 During the intake stroke the piston goes down and creates a partial vacuum in the cylinder. The intake valve is open so the fuel-air mixture in the intake manifold is pushed into the cylinder by the pressure of the atmosphere. 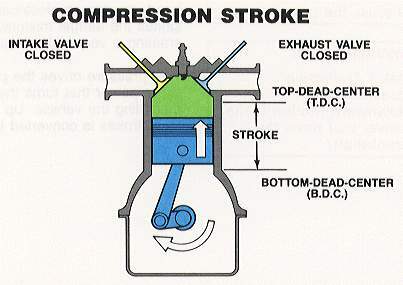 During the compression stroke the piston goes up compressing the fuel-air mixture. Both the intake and exhaust valves are closed. The compressed fuel-air mixture is ignited by a spark and the burning mixture generates pressure which pushes the piston down briskly. This is the power stroke. 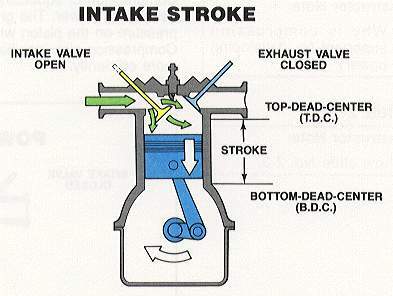 The intake and exhaust valves are closed during this stroke also. Then the piston comes back up on the exhaust stroke with the exhaust valve open forcing the spent gases out of the cylinder. Then during the next intake stroke the piston goes down and creates a partial vacuum in the cylinder. The intake valve is open so the fuel-air mixture in the intake manifold is pushed into the cylinder by the pressure of the atmosphere. And so forth and so on until you run out of gasoline or turn it off.. Pretty simple, right? Well, maybe for Otto’s original 4 stroke motor which made 3 horsepower at 180rpm..
What really happens is another story. The problem is that the air-fuel mixture has weight and inertia and in a modern high speed motor the simplicity is lost because of that simple fact of nature. At 6000rpm the four strokes of a motor takes only 1/50th of a second.. Not very long. Using the Dyno2000 program I entered a bogus cam which opens and closes the valves at top dead center and bottom dead center like in the ideal 4 stroke motor explained above. Also in the chart are the curves for a real motor (“Goody” a modified Chevrolet 350 V8 I built) As you can see the ideal cam timing leaves a little to be desired. The only difference between the motors in the curves is the cam timing. Back to the reality of the operation of a modern 4 stroke motor. Here we have to look at the cycle from the point of view of the valves and sparkplug as well as the piston.. The intake valve opens during the last part of the exhaust stroke (the exhaust valve is still open and the time that they are both open is called the overlap period) Then during the first part of the intake stroke the exhaust valve is still open.. Due to the inertia of the exhaust gases leaving there is a lower pressure in the exhaust port and some of the intake charge goes out into the exhaust port directly scavenging the remnants of exhaust gases in the combustion chamber. (one of the reasons a cam with lots of overlap gives lousy mileage) The piston continues down on the intake stroke and then starts back up. Then even though the piston is moving up on the compression stroke the intake valve stays open. There is a small pulse of positive pressure sent back into the intake manifold and causes a spray of fuel (called stand off) out of the carburetor on some motors with wild cams and short intake tracts. Then the intake valve finally closes and the mixture is compressed by the piston coming up. Considerably before the piston gets to the top of the compression stroke the spark plug is fired and the burning of the mixture starts.. The piston is still coming up and it is a race between the fire and the aluminum to see who wins. If the fire wins (due to the mixture burning too fast) you can get detonation leading to much heartache.. So there you have it.. Not simple and mostly designed many years ago by good mechanics and engineers trying different things and seeing what worked.. I leave you with a quotation from Gottlieb Daimler (from the time when he and Maybach were working in the garden workshop..